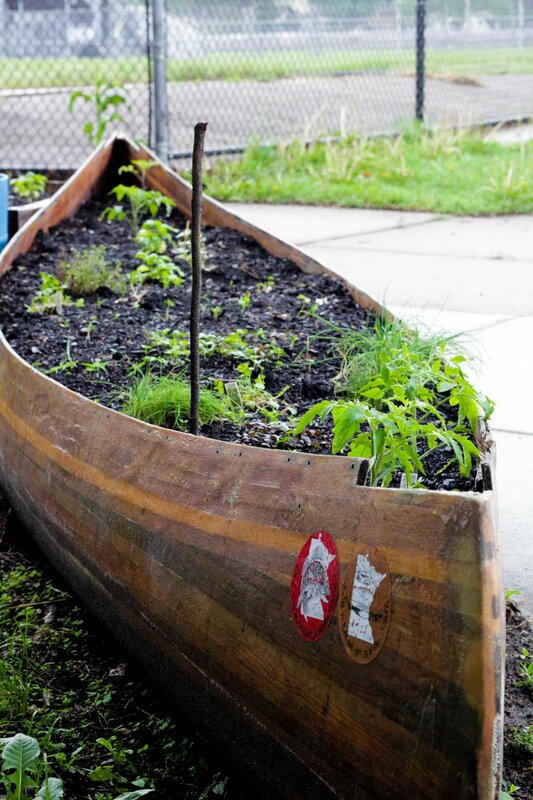 The following blog post was written by Matthew Kolasny, Sustainability Educator AmeriCorps. 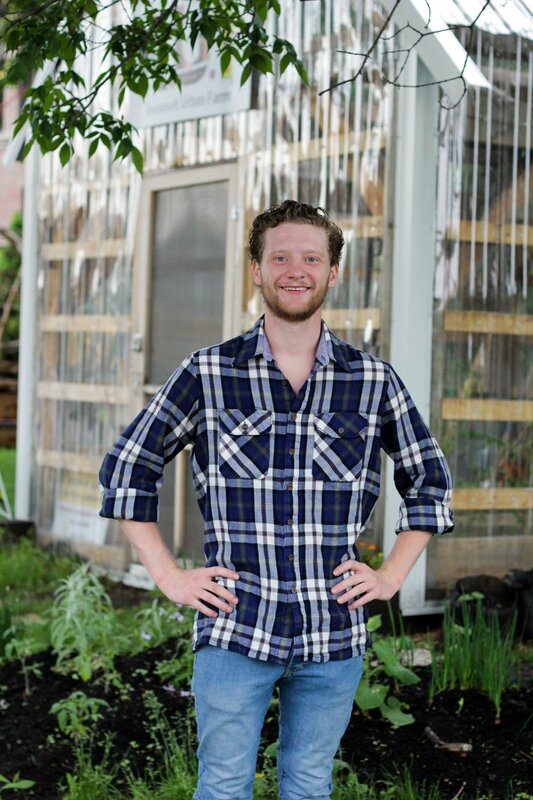 Matthew Kolasny at Roosevelt’s indoor aquaponics system. 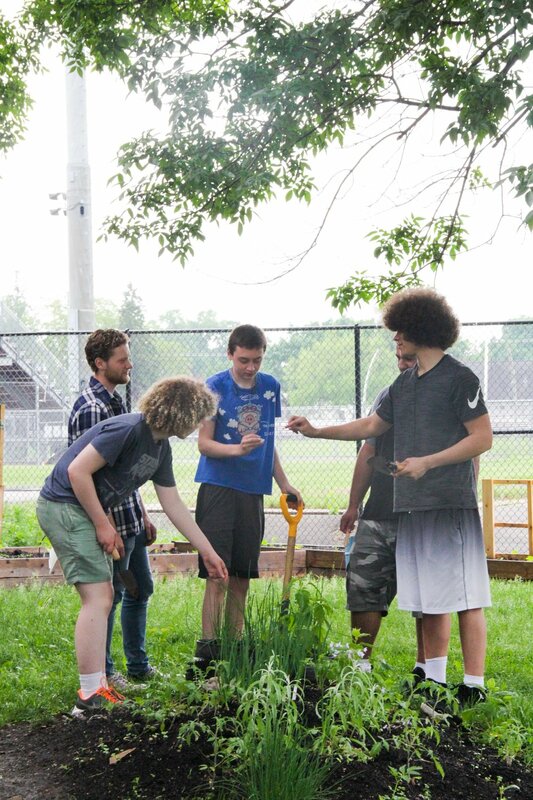 At Roosevelt High School in South Minneapolis, I have the honor of participating in and helping lead a daily high school course that exposes students to principles of sustainability, entrepreneurship, and environmental justice through urban farming. Our class is different from most I’ve known before. Our students, neither bound to a single classroom nor reducible to their performance on a final exam, help care for the sustainable systems Roosevelt Urban Farm (RUF) has in place. 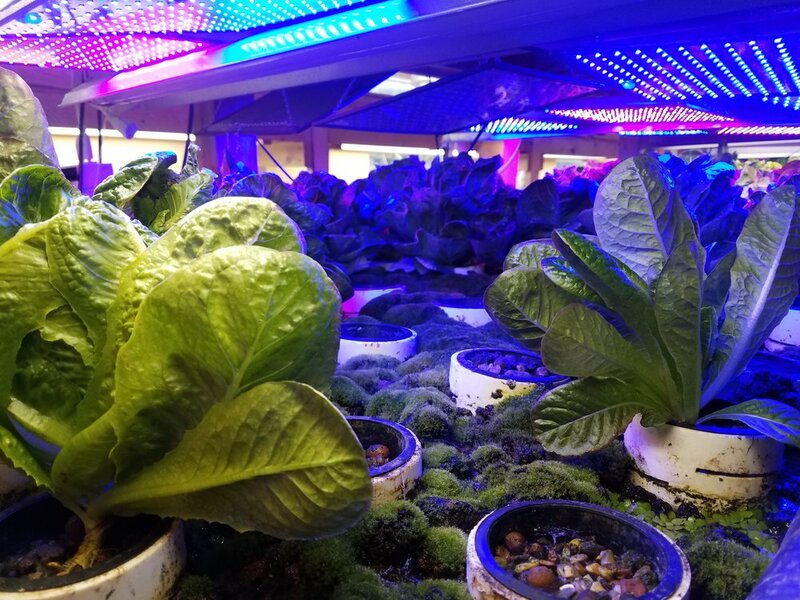 These include several aquaponics systems and outdoor growing spaces, equipped with raised beds and a greenhouse, where we produce food for our school’s cafeteria, not to mention a couple vermicomposting towers which help produce fertilizer for our farm. Our class encourages students to participate and interact with one another, to follow their natural curiosities, and to take part in the design and direction of the course. RUF broadens students' views of what “class” can be and encourages them to consider learning as a living, interactive process. 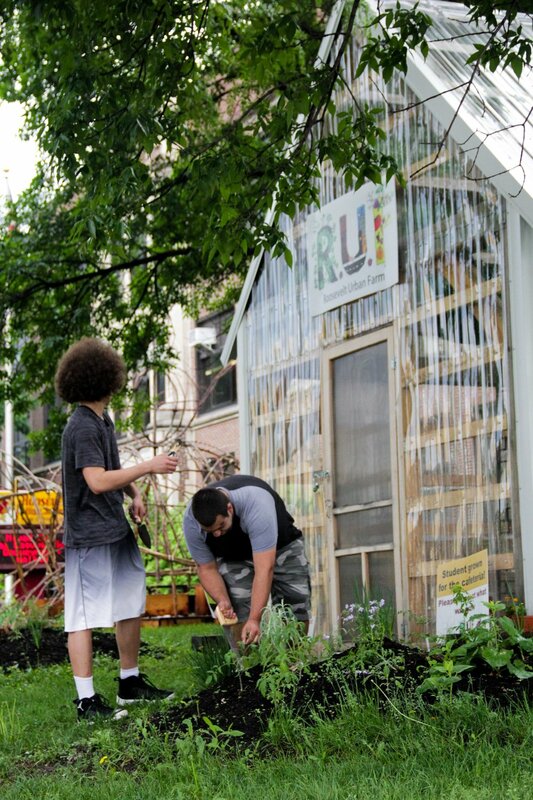 Roosevelt youth harvesting produce from their raised beds. 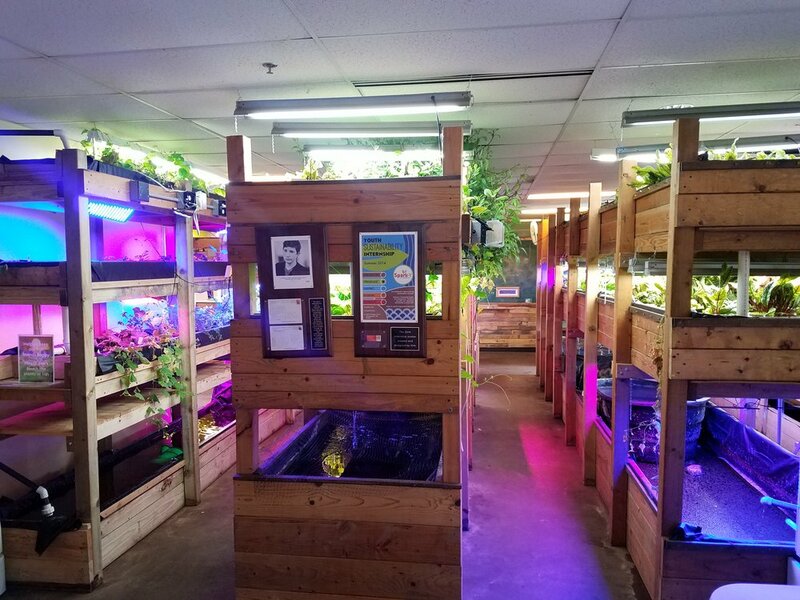 In a daily high school program, it doesn't take all that long to list the environmental benefits of aquaponics or recite the 5Es of sustainability, counting them off one by one on our fingers. Eventually, we've got to find more to talk about, and while a considerable amount of our time is spent tending to our farm, we have also studied plant and seed biology, native and indigenous farming practices and values, and labor issues amongst farm and food service workers. In my role, I try to continuously emphasize that sustainability is not measured only by how many gallons of water we save or how many pounds of waste we eliminate. Sustainability is a way of viewing and behaving in the world which acknowledges limitations and asks us how we can thrive in recognition of them. Because of this, I encourage the students I work with to consider all of what we do and study in a context of sustainability, guiding our thoughts and reactions to what we learn. We have found that there are opportunities to think and act sustainably all around us. After that, we built two. Utilizing some of Spark-Y’s designs and equipment and with fish tanks we were able to acquire from the school district we built two, ten-gallon aquaponic systems which have now been cycled and planted with Roosevelt heirloom cilantro, seeds recovered and saved by last year’s students and started by this year’s. When students have the opportunity to test their skills and interests in areas many of them have previously not ventured into, they ask questions and make observations in ways that have previously not occurred to them. Why else should a bunch of teenagers from the city care enough to learn about farming or aquaponics? To me, the answer is not necessarily about creating the next generation of sustainable farmers. Instead, I believe it’s about helping students activate their natural capacities, their curiosities to problem-solve and innovate. The moments in which I myself feel most empowered are those when I am able to connect with students somehow, when I'm able to get them to smile and take interest in what we are learning, and when they treat me as though it is worth it to them to have me and our class in their lives. They want to know what we can do to help them today before they care about how we are here to save the world tomorrow. My work with these students has shown me that once we are able to show this kind of commitment to them, they are more likely to extend that commitment to others and to the world around them. The 5th graders wait patiently in a circle, eager anticipation painted across their faces. They’ve sat through the introductions and the safety instructions, and they’re ready to get their hands on something. Gabrielle, a Spark-Y Sustainability Educator, numbers them off into five groups and encourages them to hold their group number on their fingers so they won’t forget. “Group 1 will be with Cece, measuring our lumber. Group 2 will be with Carley, using the chop saw to cut our lumber. Group 3 will be with Andrew to use drills and assemble our system and Group 4 will be with me learning about seeds and aquaponics. Group 5 will be with Sam, also assembling the system. We’ll switch stations every 15 minutes. Okay everyone, go to your station leader!” The circle scatters into five groups, and the room is suddenly transformed from an ordinary classroom into a Spark-Y building zone. Eight hours later, the classroom is equipped with a fully constructed aquaponics system. In the first three months of the school year, we’ve already built 3 aquaponics systems, 7 raised bed gardens, and the grow tent. If we continue cranking out systems at this pace, we could easily double the number of sustainable systems we’ve planned to build this year. Except for one thing: this year, we don’t want to focus on building as many new systems as possible. Building something new is exciting and honestly, it’s relatively easy to generate funding and resources to support new builds. But what happens to those systems the following year? How about the year after that? And what about the next batch of CSE 5th graders? The other week I found myself asking a group of students at Prairie View Elementary School if they knew what the word “sustainable” meant. These are especially bright kiddos, and several raised their hands to reply: “It means you can keep it going,” one said. Exactly. What if we were to measure our success not by how many new systems we build each year, but instead by how many we nurture to the point of thriving? Prairie View students learn about the system they’re inheriting and plant new seeds. This is our third year at Prairie View Elementary, and they are one of several school programs that we call “Systems Partners.” These are schools where we’ve decided to prioritize the health of existing sustainable systems, and empower the regular school day teachers to integrate the systems into their day to day curriculum. The reality is that it doesn’t make sense for Spark-Y staff to be in every classroom every day or every week. 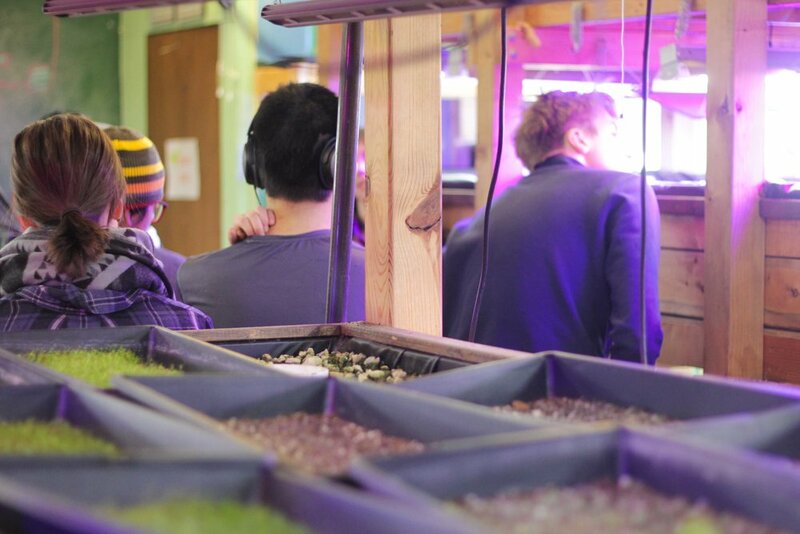 Another reality is that Spark-Y has been cranking out sustainable systems for years now: a lot of our school partners already have aquaponics systems, vermicomposting bins, and school gardens. What message can we send about sustainability if we don’t prioritize taking care of the incredible gifts we’ve inherited? In 2018-19, we’re planning to empower 1,400+ youth in regularly occurring programs and another 500 in one-time events and workshops. The vast majority of these students won’t be building something new; they’ll be improving and expanding on systems that already exist. 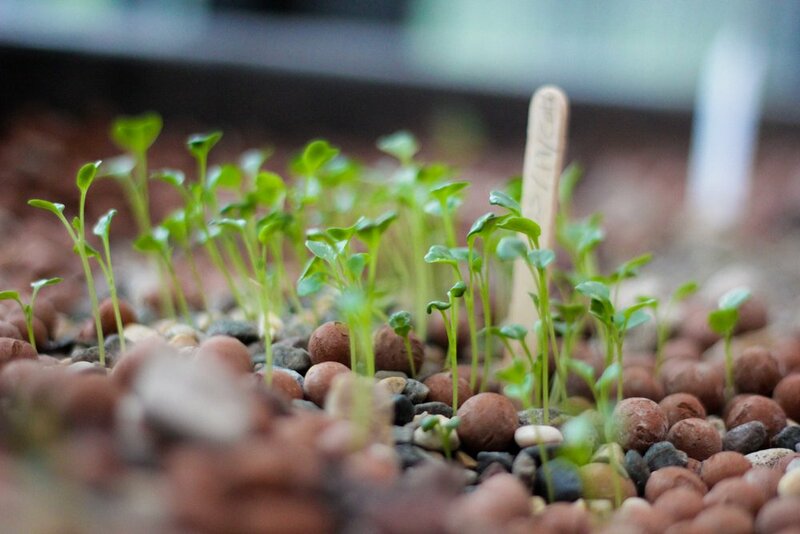 The students in Edison High School’s EASYpro (Edible Agriculture Schoolyard Professional) class will be re-building a defunct portion of their aquaponics system to allow them to produce microgreens for their school cafeteria. The students in Roosevelt High School’s Urban Farming class expanded their rain garden and the students at Northeast Middle School will be revitalizing the vermicomposting bins that fell into disuse. 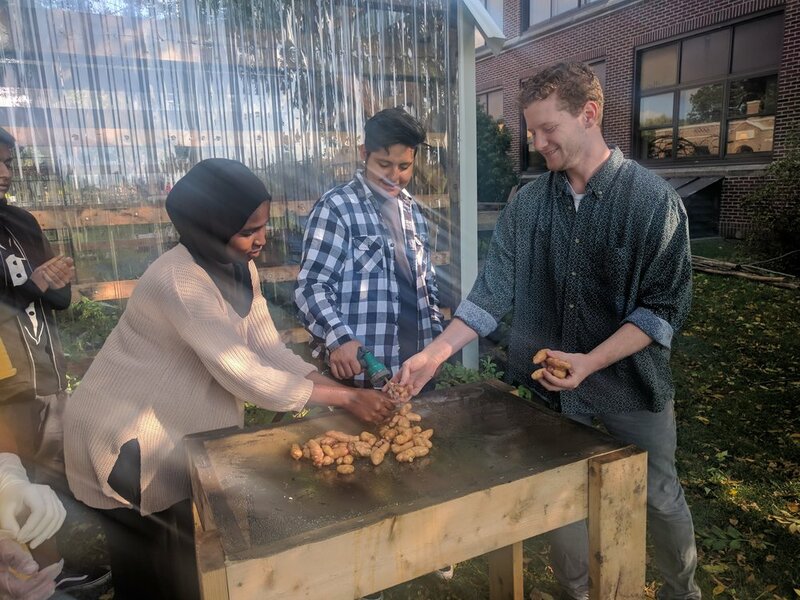 Spark-Y staff and Columbia Heights students are working closely with the Blooming Heights garden coordinator to re-shingle the garden shed and repair old cold frames. Above: Roosevelt students add new perennials to the school rain garden, including American highbush cranberry. This year we’ve decided to invest some time in strengthening Spark-Y’s foundations. In addition to tending existing sustainable systems in 12 schools across the Twin Cities, we’re taking a deep dive into developing and polishing our curriculum and organizational systems. We want to streamline our processes, document best practices and make sure that we do can be replicable. We’re challenging ourselves as a staff team to take the quality of our programming to the next level by integrating restorative practices to our behavior management plan, connecting our curriculum to broader school units, and linking our activities to MN state standards. 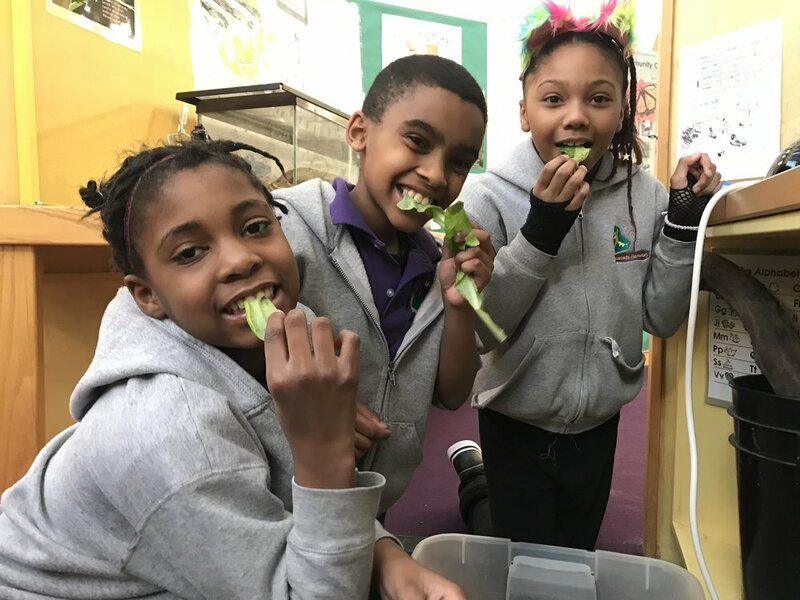 When the 5th graders at the Community School of Excellence are in the school’s Justice unit, their Spark-Y days will be filled with food justice and watershed protection activities. When they go to take the Science MCA test at the end of the year, they will be equipped with hours of Spark-Y facilitated, hands-on experiments leveraging their in-class aquaponics systems. In the long run, the investments we make in quality and care of our systems--whether they’re meant to produce food, empowered youth, or both--will pay off by allowing us to not only achieve our mission, but keep that impact going. Northeast Middle School student hangs out at the square foot gardening activity table when he was struggling to follow power tool safety directions during Garden Build Day. Within minutes of beginning this hands-on activity he went from angry to calm and proud of his work. Youth Empowerment. This is our mission as an organization and also a directive that shapes our organization - from the curriculum we deliver in our school programs and the real-world approach we take in our summer internship program, to the opportunities for community outreach and youth employment we provide through Urban Agriculture Lab. These three branches of our organization work systemically to positively impact Twin Cities youth, providing multiple pathways for empowerment and growth both within and beyond our organization. Perhaps this is why so many of our Spark-Y youth begin in our school programs, graduate from our summer internship program, and go on to gain employment at Spark-Y or other organizations as a result of their experiences. As an organization we are always asking ourselves the same question: How do we measure youth empowerment? Can it be measured by student grades in our school programs? Or by the dollar value of projects completed in our summer internship? The transformation of disengaged students who rally to save a classroom fish, complete an assignment for the first time in their classroom history, or join an elective leadership opportunity (our elementary Captains program). 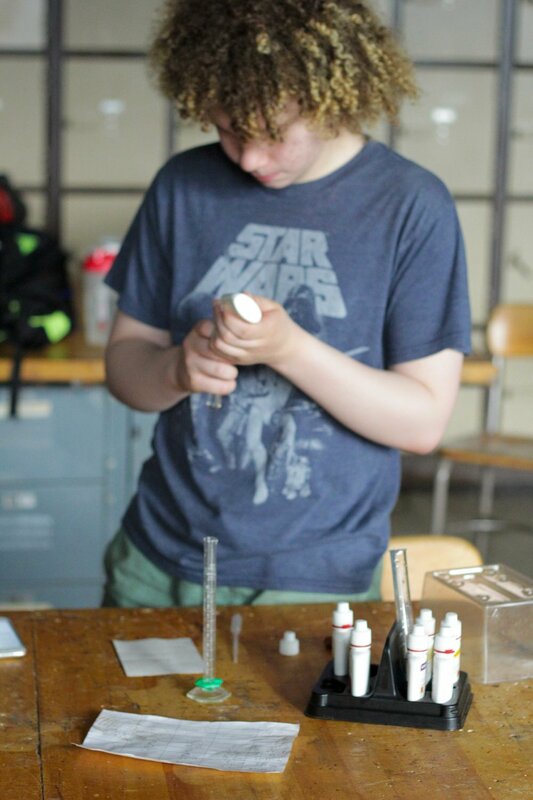 The marvel of watching student-led creations come to life, as young people use STEM-based learning and utilize power tools to design, build, and cultivate their own sustainable systems. Youth interns sharing their summer internship successes on stage in front of our Minneapolis Mayor, Jacob Frey - then going on to secure jobs and admittance to higher education programs as a result of their experiences. As we continue to share these meaningful stories of youth empowerment on our blog, Facebook, and Instagram we also want to share the other side of how we measure youth empowerment, through our Spark-Y Impact Report. This report is designed to help us as an organization measure our successes, focus our future efforts, and paint a broader picture for our supporters (that’s you!) the value of your investment in our organization. Together, we are empowering more Twin Cities youth than ever before. This branch of Spark-Y provides hands-on education, rooted in sustainability and entrepreneurship to Twin Cities youth in school classrooms, workshops, one-time events, and customized programming. 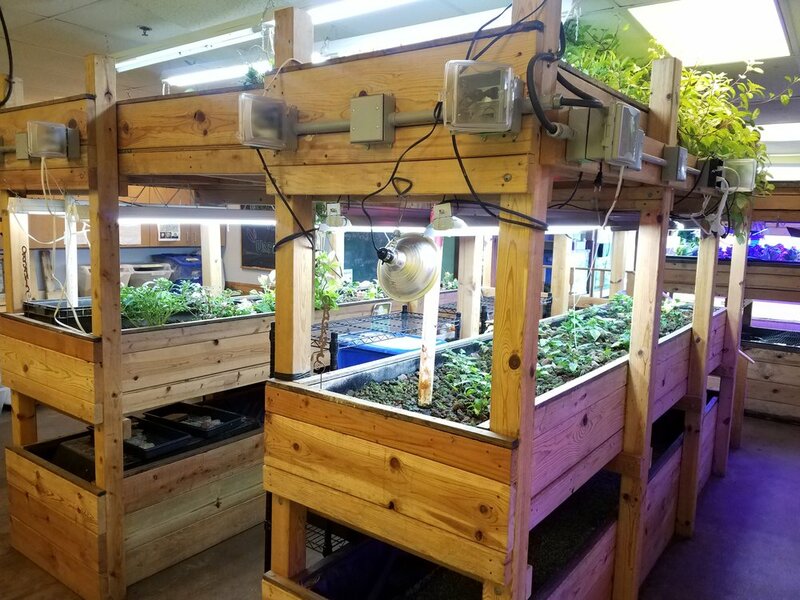 In 2017-2018 Spark-Y doubled the number of permanent aquaponics systems built in the previous year. Addition of Edison High School LEAF (Leadership Education Agriculture Future) program - a diploma certification with Spark-Y programming spanning 5 class offerings. Our third year of programming at Roosevelt High School, including our urban farm and EASY Pro (Edible Schoolyard Professional) programs. Our seventh year at School of Environmental Studies. We also celebrated our fifth year at Southside Family Charter. After participating in a Spark-Y school program, 62% of youth reported knowing ways they can live more sustainably. 2 school interns from a continued partnership with HECUA program (non-profit with a focus on social justice, human rights and sustainability). 2 AmeriCorps members on staff. 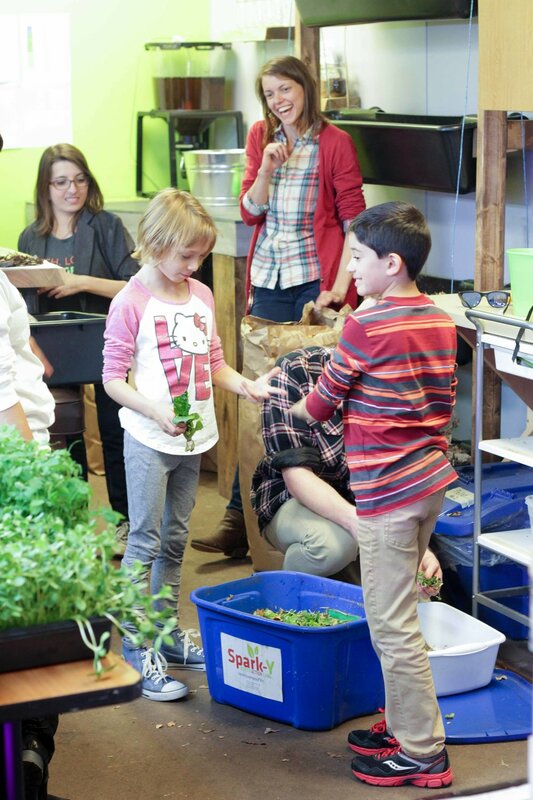 The second branch of Spark-Y, the Urban Agriculture Lab, provides support to our school programs through sustainable systems research, facilitation of youth classroom builds, and ongoing maintenance to in-classroom systems. The UAL operates in indoor production facility, providing a sustainable revenue model for the organization and a youth job pathway. 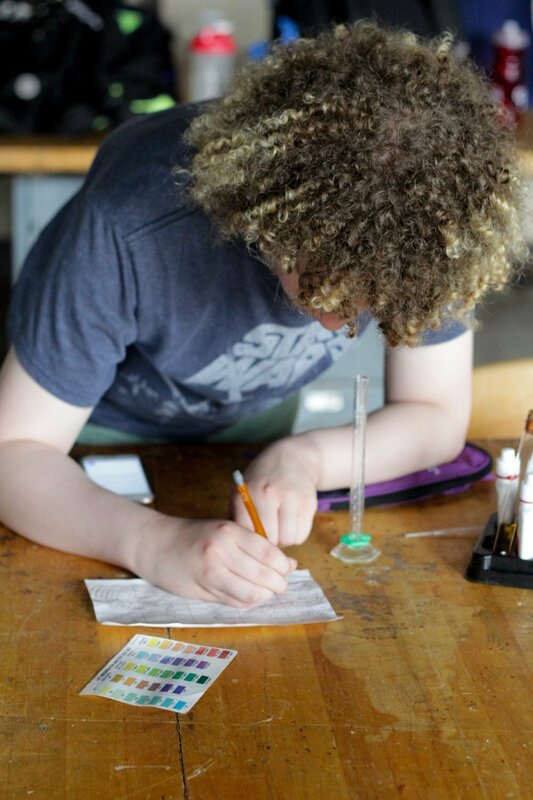 Lastly, the UAL is home to our DIY Bio Lab, equipping our classrooms with new, innovative science projects and providing workshops and outreach throughout the Twin Cities. Reached 167 youth and 175 adults through tours. 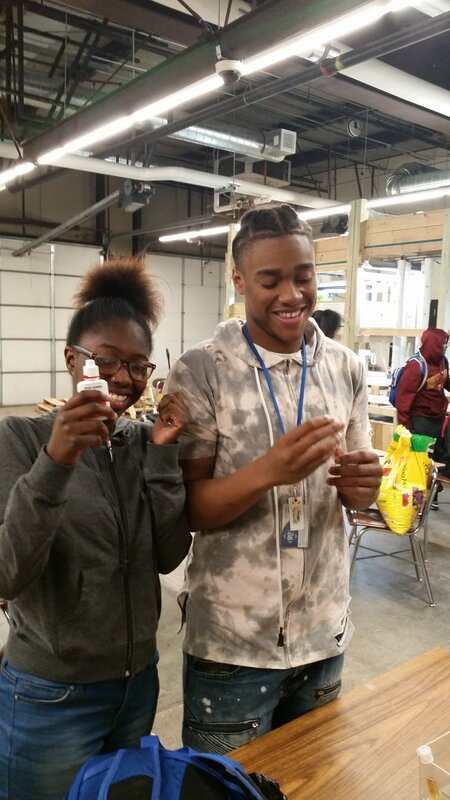 Impacted 199 youth with hands-on STEM workshops, in a new partnership with Hennepin County Libraries. Provided a work-based learning internship with 3 Edison students, complete with class credits and stipends. Impacted 23 youth at our second year in attendance as speakers at CONvergence. 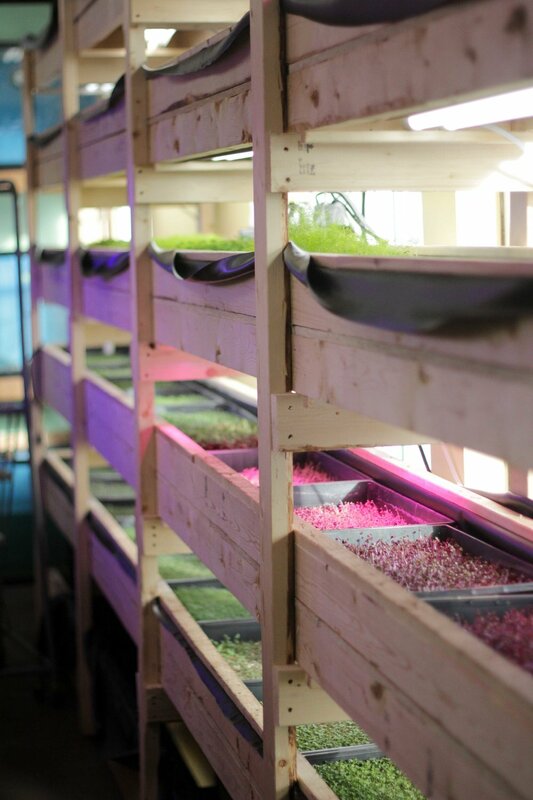 Spark-Y moved office headquarters in August of 2018, moving their 1,300 square foot indoor aquaponics system to construct a timber-frame, vertical growing system at their new offices in Northeast Minneapolis. Hosted a Spring Plant sale, attracting hundreds of visitors. Featured exhibitor at the Minnesota State Fair, Common Table. A stop on the 2018 Farm Tour. The third branch of our organization, the Summer Internship Program, a sustainability bootcamp where young people gain real-world experience through hands-on projects with our Twin Cities partners. 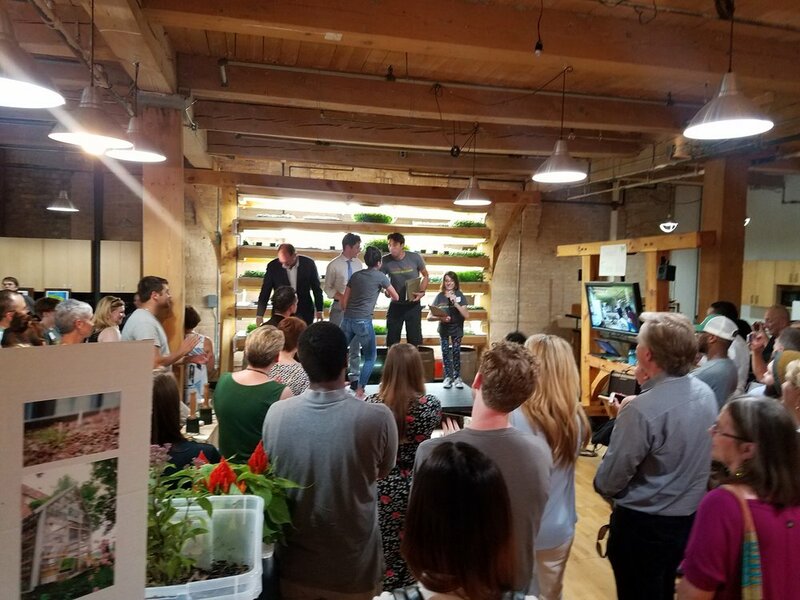 2018 interns receiving paid stipends, with Minneapolis Mayor Jacob Frey, in front of a youth-built timber frame aquaponics system at the Spark-Y Open House. With a nod to this last year’s accomplishments, we also look forward to focusing our efforts in key areas of growth to create even more impact in the year to come. Creating even more ways to measure our impact, including, entrance / exit surveys and methods of qualitative data collection. Expanding our community workshop offerings to build interest and curiosity in new communities. Thinking of new and innovative ways to fund and expand into new school partnerships, including the ten schools on our current wait list. Adding professional certifications to our work based learning programs. We are very excited to share this information with you. We appreciate your continued support of our organization and other Twin Cities organizations that are actively uplifting the lives of youth all around us. We could not do this work without you. We thank all of our volunteers, staff, Board, fiscal contributors, partners, and cheerleaders for your ongoing support. Let’s keep building towards empowering our youth, so that they can go on to empower their families, schools, and our greater community! In the last month we have received in-kind support of our organization from the Joan Brick McHugh memorial. These donations were given to honor her memory, and for that, we are sincerely grateful. We would also like to recognize Spark-Y Founder, Mary Helen Franze, for her ten years of service on our Board of Directors and for choosing Spark-Y to honor her mother's memory. Spark-Y Education Facilitator & Green Corps Member. With the school year coming to a close there is a bittersweet aroma in the air as we are forced to say goodbye to the Senior members of the Roosevelt Urban Farming Squad (or RUF Squad for short). Although we are happy to see them graduate and move on to their next chapters in life we are sad to see them leave the farm that they have made their own. However, the senior RUF squad members are not leaving the school without leaving a lasting impression; this year Roosevelt’s campus has truly been transformed by the RUF squad through the various projects and sustainable systems or structures they have built. At the start of the 2017-18 school year the RUF squad wasted no time and hit the ground running, immediately going to work on their outdoor farm and greenhouse, harvesting produce in the farm and selling it back to the school to be used in the school lunches through their Garden-to-Cafeteria program. The students in the RUF squad were also simultaneously learning about and taking care of their aquaponics system, truly exemplifying the hands-on learning experience that Spark-Y is all about! Needless to say the students appeared to have their hands pretty full, but it seems as if that wasn’t quite enough for the RUF squad because they continued to look forward and began to strive towards making their school’s campus even more sustainable. The RUF squad then built not one but TWO vermicomposting systems both complete with two vermicomposting bins adding up to a grand total of four bins filled with happy and hungry worms (more fondly known by the students at Roosevelt as red wigglers). Building two vermicomposting systems to help reduce waste from the waste stream at Roosevelt is already a major accomplishment but still the RUF squad pressed onward, pausing only briefly to admire their work. The list of projects and tasks that the students worked on after this goes on and on, ranging from designing a rain garden to researching vining plants native to Minnesota to cover the turtle sculpture created by artist Christopher Lutter-Gardella (they landed on vitis riparia, more commonly known as frost grapes). The school year seemed to fly by and end, but in a final act of altruism by the seniors of the RUF squad they left behind their farm complete with seedlings for next year’s incoming RUF squad to harvest in the fall, setting them up for another successful school year. With all of the projects and hard work behind them the RUF squad finally had time to take a breath and reflect on their past school year. Seeing all of the amazing work and effort they put into their farm this year, it was no surprise that they would put the same amount of effort into reflecting on the school year. Here’s just a handful of stunning reviews which would give Roger Ebert a run for his money! Here’s looking forward to next year’s RUF Squad, the bar was set high this year but I have complete faith that they will go above and beyond it. Copyright Spark-Y: Youth Action Labs. All rights reserved.